Warhol's series of screen prints highlight endangered or threatened species. The giant panda and African elephant are two of the animals Warhol used for his screen print series. The Cleveland Museum of Natural History combines Pop Art with wildlife conservation. Andy Warhol is known for reimagining American icons like Marilyn Monroe or the Campbell’s Soup can. But he gave endangered or threatened animals the spotlight, too, from the African elephant to the Siberian tiger. "So they really grab your attention. These aren't wallflowers, I mean they really pop," Chief Wildlife Officer Harvey Webster said. The 10 vividly colored prints are all animals that were threatened or endangered when Warhol created them in 1983. "Anyway that we can celebrate biological diversity and conservation, we want to use it. And art is a really powerful way to do that," Webster said. The animals get the full Warhol treatment. They’re brightly colored with deep contrast, almost like psychedelic photo negatives. The artist only produced 150 sets in this series. "Andy actually was an animal lover," Registrar Amber Anderson said. Warhol's quote is prominently featured in the exhibit. "One of my favorite quotes from Andy is 'I've never seen a bad looking animal.' So these aren’t bad looking animals. These are beautiful animals, eight color silk screen, large-format prints," she said. Due to light sensitivity the prints, which the Museum has owned since the '80s, are only displayed about once a decade. While you might think Warhol’s work is more at home across the street at the Cleveland Museum of Art, Webster said the artwork fits in perfectly here because it highlights the Natural History Museum’s core tenet of protecting biological diversity. "And that’s a great segue into this exhibit because basically that’s what Andy Warhol did in creating these extraordinary images was to sort of in his own inimitable, pop art style was to use the power of his fame and his reputation to bring attention to species that were endangered," Webster said. While the Warhol prints feature the giant panda, Pine Barrens tree frog and even the San Francisco silverspot butterfly, the museum has a special relationship to one particular animal in the series: the bald eagle. Outside the doors in the Museum's wildlife pavilion is the raptor center. With a quick whistle Webster introduces me to George the bald eagle. George, perched on a branch looking at us with a keen eye, whistles right back. George is one of two bald eagles the Cleveland Museum of Natural History houses. George is one of two bald eagles housed here and used in education programs. Webster said if you look carefully you can find bald eagles like George throughout Northeast Ohio. But back in the ‘70s, years of wide use of pesticides like DDT nearly wiped out bald eagles across the country. "And what it did is it either outright poisoned them or it robbed the females of the ability to put a good, thick eggshell on their eggs. And they would lay an egg and it would crumple beneath them." By 1979 there were only four active eagle nests in the state. Webster and his team at the museum have worked to save the species here in Ohio for decades. "So we got in the business of trying to breed bald eagles in captivity with the idea of producing eaglets that could literally be put up for adoption in wild nests." Through artificial insemination, they had their first eagle adoption success story in the early '80s and placed eaglets in local nests until 1999. The bald eagle was taken off the endangered and threatened species list in 2007. 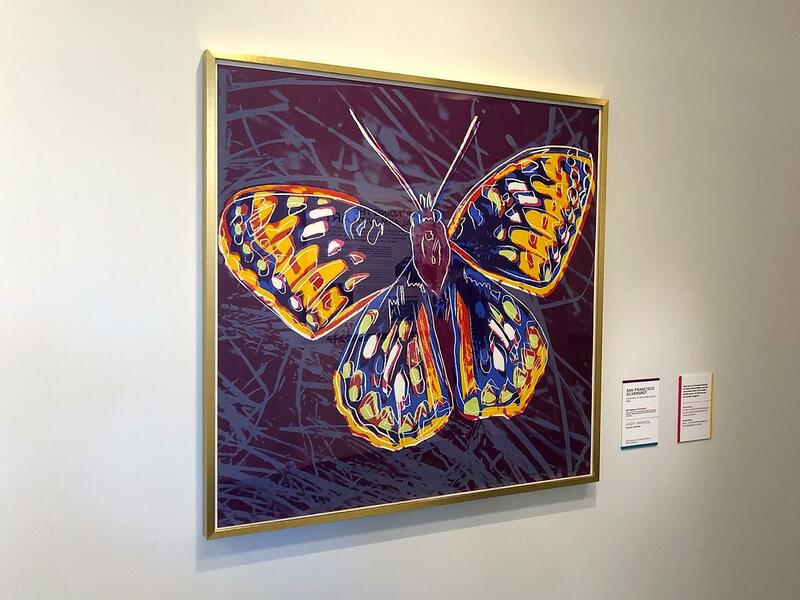 The silverspot butterfly is one of the more colorful entries in the Warhol exhibit. "There’s a small park in Eastlake Ohio, it’s nothing more than a ball diamond, and just beyond center field there’s a big nest and bald eagles are actively nesting there. There’s an elementary school in Lorain County, in Avon Lake, and towering right above the playground right about the school is an active bald eagle nest," Webster said. "You can encounter eagles almost anywhere. We have eagles now nesting within the city limits of Cleveland on the Cuyahoga River." Even though the bald eagle is a conservation success story, most of the other animals Warhol represented are still listed as endangered or threatened including the orangutan, the Grevy’s Zebra, several species of sea turtle and the Black rhinoceros. And Webster thinks Warhol’s crusade to highlight these endangered species back in the ‘80s is just as important today. "The idea that you would celebrate them in all their glory, with vibrant colors. Again, it just was a neat, new way of drawing attention to it. Appreciate the silk screen as art, but then be tapping into the message behind why he did it." 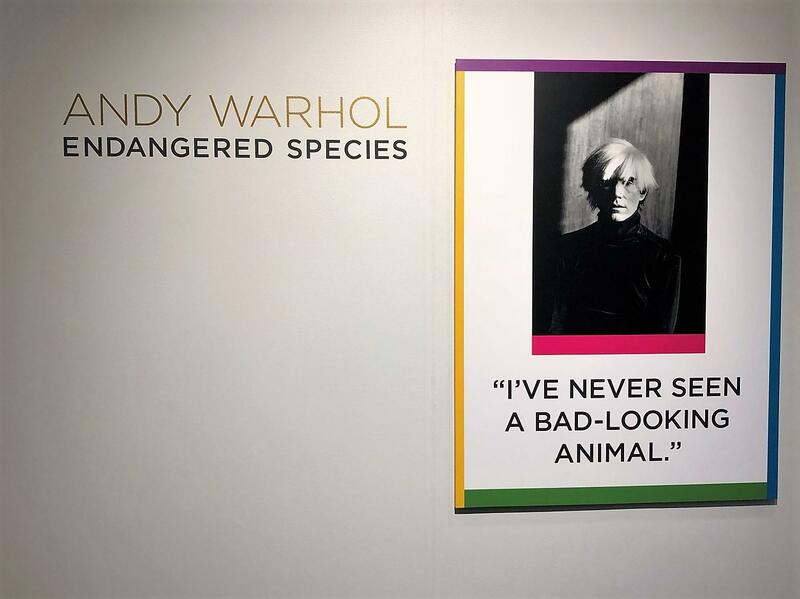 Andy Warhol’s "Endangered Species" series is on display at the Cleveland Museum of Natural History through March 3, 2019. If you’re looking for some tips on something new to watch, read, or listen to, look no further than the library. In this week’s State of the Arts, WKSU’s Mark Arehart sat down with Robert Ethington, manager of the culture and audio visual department at the main branch of the Akron-Summit County Public Library. They talked about the most popular picks of 2018 from the library’s collection. TONY VACCARO (American, b. 1922) / Georgia O'Keeffe Museum, 2007. The long career of Georgia O'Keeffe is being re-examined at the Cleveland Museum of Art. The exhibit "Georgia O'Keeffe: Living Modern" is an ode to how an accomplished seamstress and talented painter became one of the country’s most beloved artists. On this week’s State of the Arts, WKSU's Mark Arehart walks through decades of her artwork, clothing and photographs. A New York-based artist is reimagining some of art’s beloved masterworks and creating something completely new with pieces from the internet age. On this week’s State of the Arts, WKSU's Mark Arehart talks with Allison Zuckerman about her new show, "Pirate and Muse," which is on display at the Akron Art Museum through Jan. 21. Bob's Hamburg is a beloved greasy spoon in Akron known as much for its unchanged décor as its food. But there could be a change in ownership coming. On this week's State of the Arts, WKSU's Mark Arehart takes us to the restaurant that’s stood in the same spot for nearly 90 years. Ohio native Clarence H. White is considered one of the founding fathers of artistic photography. His work is now being celebrated at the Cleveland Museum of Art. On this Week’s State of the Arts, WKSU’s Mark Arehart explores the new exhibit "Clarence H. White and His World: The Art and Craft of Photography, 1895–1925."